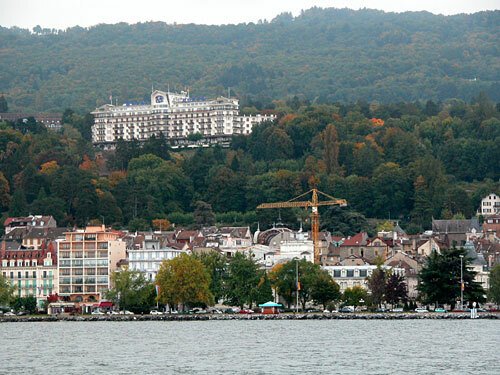 The 2003 G8 Summit took place in Evian-les-Bains, France, from 1 to 3 June 2003, in the Royal Hotel. Funimag could not miss this opportunity to publish an article about the Evian-Neuvecelle funicular which is located in the real center of the G8 forbidden area! Evian-les-Bains is located on the southern shore of Lake Geneva (Lac Léman in French) in the northern part of the French Alps, in the Department of Haute-Savoie. The Royal Hotel, today, above Evian-les-Bains. 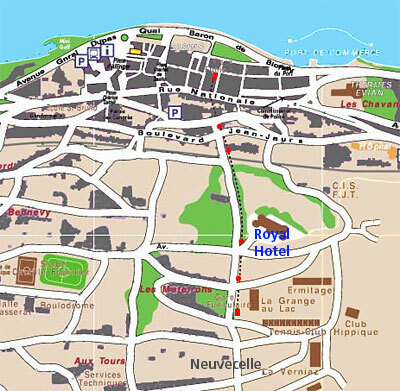 The funicular is on the right of the Royal Hotel, under the trees. The 'Société des Eaux', owner of the newly built Royal Hotel, built in 1907 a private and free electrical funicular railway to bring the rich customers of the hotel to the Source Cachat, the most famous source of Evian Mineral Water. 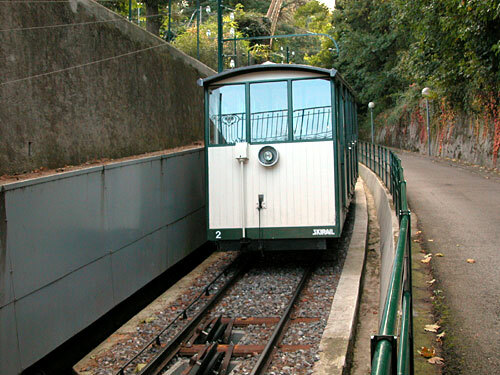 This funicular railway was only 357 meters long, from the Buvette Cachat and the Royal Hotel, with only one intermediate stop at the Splendide Hotel. 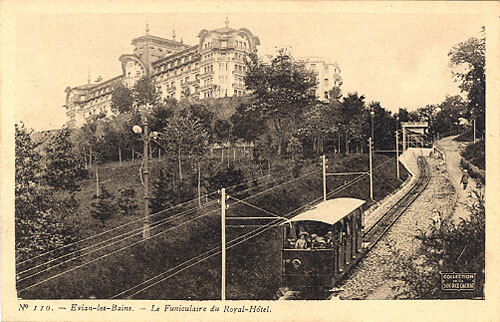 The Royal Hotel and its private funicular at the beginning of the XXth century. The Splendide Hotel which does not exist anymore, its is now tennis courts. 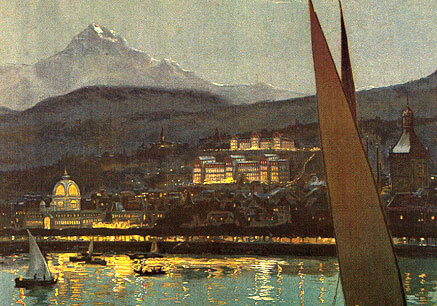 Old poster showing Evian with the funicular and the Splendide and Royal Hotels and the Dent d'Hoche in the background. 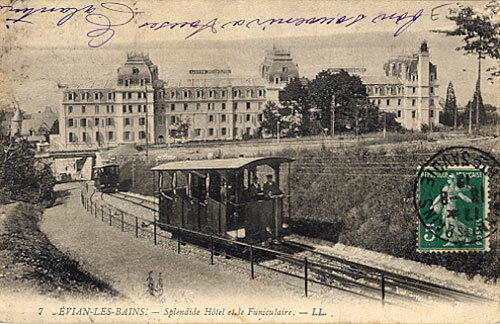 In 1913, the funicular railway was extended at both ends, downward underground below Rue Nationale toward le bottom station near the Evian thermal baths and upward to Neuvecelle with three new stops and a total of six stops (Evian Thermal Baths, Buvette Cachat, Splendide Hotel, Royal Hotel, Les Mateirons, Neuvecelle). In September 1969 it was decided to stop the funicular and it remained abandoned along decades. At last in 1995, with a new town council, it was decided to restore the funicular! It took six years to identically restore the funicular railway as it was in 1969. The funicular re-opened to the public in June 2002. It is affirmed, on some publicities, that the funicular of Evian is still the only funicular in the world with six stops! I am sorry to say that it is not true anymore! Since December 16th 1997, the funicular Sierre Montana Crans has eight stops! See my web pages about the SMC funicular in Funimag 12 .